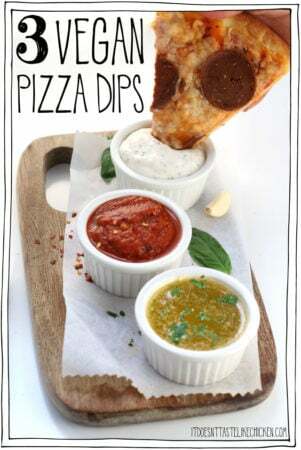 Quick and easy to make with just a few ingredients each, you can make all three in the time it takes to order a pizza or cook your own! Optionally, if your tomato sauce is lumpy, you might want to start by using an immersion blender or small standing blender to make a smoother sauce for easier dipping. Then simply add all of the ingredients together in a small bowl and stir to combine. If you prefer a hot marinara, heat it in the microwave or in a small pot on the stove before serving. Melt the vegan butter in a small saucepan over medium heat. Once melted, add the garlic and cook for 1 - 2 minutes until fragrant. Remove from heat and stir in the parsley. *2 tablespoons of the creamy garlic is 182 calories. 2 tablespoons of spicy marinara is 8 calories. 2 tablespoons of garlic butter is 169 calories.